Ghosted Review - Screwball Comedy Hopes Audience Exists - Are You Screening? Screwball comedies are tricky to pull off, and though it may seem counterintuitive, buddy screwball comedies add another level of difficulty. 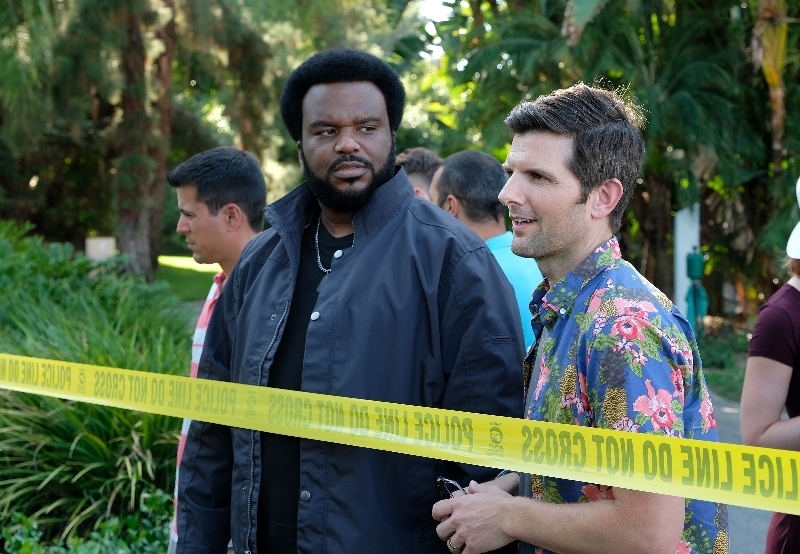 You’d think that Adam Scott and Craig Robinson could pull it off, and there is some chance that they will hit a stride in future episodes, but Ghosted doesn’t start off strong. Leroy (Robinson) and Max (Scott) are two guys who were once at the top of their fields. Leroy was a detective noted for an uncanny ability to find missing persons, and Max was an astrophysicist widely regarded in the field. We now find them working mall security and customer service in a bookshop, but when a government agent investigating paranormal phenomena mentions them specifically as who to contact if anything goes wrong, this unlikely duo will find their lives upended yet again. This is a show with aliens, ghosts, and other bizarre events worthy of investigating, and it plays out like a live-action spin-off of Scooby Doo… which isn’t necessarily a bad thing. Despite having their world’s rocked, and their perspective on reality thrown out the window, Max and Leroy can’t stop getting on each others’ nerves, even when survival dictates working together. The problem with the show, for all its zany efforts and corny danger, is that the banter doesn’t play solidly enough. That could improve over time, but it’s difficult to hope for an improvement in writing, or that their natural chemistry will improve. They’re both great in the right roles, but they feel wooden maneuvering through the clunky scenes and dialog. This one may have some decent supporting characters, but Scott and Robinson have to carry everything here and they don’t get the material they need to hold onto an audience. With several shows out there that are similarly screwball, like People of Earth as an example that also matches the paranormal setup, it seems that a decent enough audience exists for comedies that move into such a realm. The key difference is that People of Earth has a huge cast, by sit-com standards, so no one has to carry too much of the burden and the writers have a million tools at their disposal. Here, if the duo’s relationship doesn’t work immediately, there’s no other reason to tune in. Worst of all, the show just isn’t that funny, though a fair amount of the problem there can be chalked up to the establishment needs of a convoluted premise. It does have some moments that might make you laugh, but the wackier your premise, the more laughs you better be able to get out of it. There’s hope for the show, because both of these guys have the ability to deliver. The question is whether or not the two characters are going to be able to morph into vehicles for delivering comedy outward, instead of just irritating each other. You also have to wonder how silly each episode is really going to be, because the ‘alien’ spectacle we get in the pilot might be a bit further than the comedy can handle. If the show becomes confident enough to pull away from its own shtick and let Robinson and Scott deliver the kind of effort they are best suited to, it could become light fare worth watching, but it doesn’t kick off in a way that makes you confident it will be around that long.